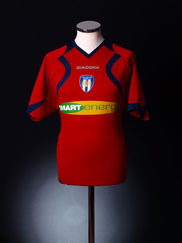 Colchester's kit has been based on blue and white for their entire history, and mostly in the form of stripes. There have been some variations on the theme, such as 1993 & 1997. They also played briefly in all blue, and all white shirts between 1969 - 1973.